The Christmas holiday season cannot pass without a chocolate mousse. I have been making them for years............... every year! Sometimes with cream added, sometimes without. Sometimes using milk chocolate, sometimes dark and sometimes a combination of both. This year, I went for a very deep, rich mousse made with all dark (70%) chocolate and just a little cream………. Very grown-up with a slightly bitter chocolate flavour, so a little goes a long way. It is however, absolutely delicious, especially when partnered with a light, fluffy white chocolate cream. The sweet caramel notes of the white chocolate perfectly offset the darkness of the chocolate and make this a flavour combination that becomes very moreish and quite addictive. If you don't like your chocolate too dark, just substitute with milk chocolate and the mousse will be just as delicious, if a little sweeter and milkier. Trust me, I have tried both many times and whichever you prefer will be delightful. 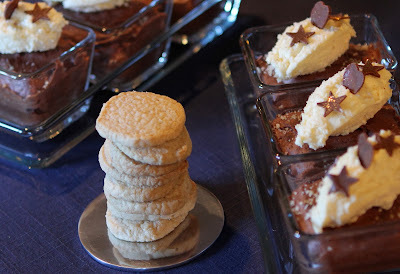 This year I also made some little hazelnut biscuits to sit alongside the mousse. These add an alternative texture to the dessert and the hazelnut works in perfect harmony with the dark chocolate. I think actually, that these are the most delicious gluten free biscuits I have ever made. They are light, crisp, not too sweet, nutty and truly melt in the mouth. The best comparison I can make is a really light, buttery, hazelnut shortbread, but better. One bite and you are hooked! The biscuits were a bit of an experiment I confess, but I have all sorts of plans for them now that I have stumbled across them. I can't wait to make some and dip them in chocolate ......……….. Break the chocolate into pieces and melt, stirring with the butter in a bowl over a pan of just-simmering water (or place in the microwave and heat on medium, in 30 second bursts, stirring well between each until just melted and completely combined). Beat the egg yolks one at a time into the melted chocolate mixture, using an electric whisk. Add and beat in the vanilla and any liqueur if you are using. In a separate bowl, beat the cream to form soft peaks and set aside. In another bowl (and using clean beaters), beat the egg whites to form soft peaks and set aside. Beat half of the cream into the chocolate mixture and then fold in the remaining cream and egg whites a little at a time until fully combined. Spoon the mousse into small serving dishes and then allow to set in the fridge. Once melted, set the chocolate aside to cool slightly. Whip the cream with an electric whisk until it begins to thicken. Add the custard and continue to whip until the mixture forms soft peaks. Add the chocolate to the whipped cream and gently fold in until completely combined. Top each mousse with a spoon or quinelle of the white chocolate cream. Shape the dough into a sausage (about 4 cm in diameter), wrap in baking paper or clingfilm and refrigerate for about an hour to allow to firm-up. Remove the dough from the fridge and cut into discs about ½ to 1 cm thick. Place the discs on the baking sheets and bake for 10 to 12 minutes until the edges are just beginning to darken very slightly. Ohhh yes! Rich dark chocolate is the way to go for me. They look delicious and the hazelnut cookies sound yummy too. Sort of like a melting moment my mum used to bake with half a cherry on top. Wow, all three components sound utterly delightful! What a fabulous and very special pud. Happy New Year to you and thanks for all your Family Foodies and Four Seasons Food entries in 2013! They all looks realty delicious and I really hope I can have anyone of them. Just cannot help wanting to have a try. And, in order to thanks for your post, I would recommend you one data recovery freeware which does a good job in taking my deleted camera photos back.